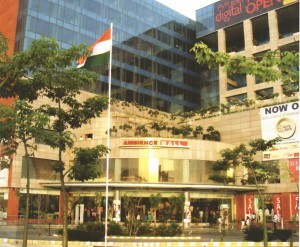 Ambience Mall Gurgaon is the biggest shopping destination in the national capital region and is one of its kinds in India. The gigantic mall, which was unveiled in the year 2007, has one kilometer of shopping on every floor. Given its optimum location, a flat ‘0’ km from south Delhi and an 8-lane approach on the national express highway, Ambience Mall offers all the international desirables to revolutionise the shopping experience, from convenience of parking, to day-to-day shopping, to state-of-the-art entertainment, to luxury shopping. Ambience Mall Gurgaon’s well thought out tenant mix and shopping environment is designed to exceed all customer expectations. The complex boasts of a Five Star Deluxe Hotel — The Leela Kempinski, servicves apartments, shopping of about a kilometre on each retail level, a wide variety of entertainment options (seven screen multiplex with two Gold Class theatres), a vast range of cuisines, children’s play and party area, a corporate tower, an hypermarket, three-level basement parking, professional mall management and much more. The Mall has 165 stores in operations from Adidas, Bembos, Biba, Bossini, BMW, Kimaya, Reliance Digital etc. You can see the complete list of stores / tenants of Ambience Mall here.